Tomatoville® Gardening Forums Index > We're Here For The Tomatoes!™ > Soilbuilding 101™ > Composting: make no bones about it? Tomstrees posted a thread about using a lawn mower to shred leaves for compost. 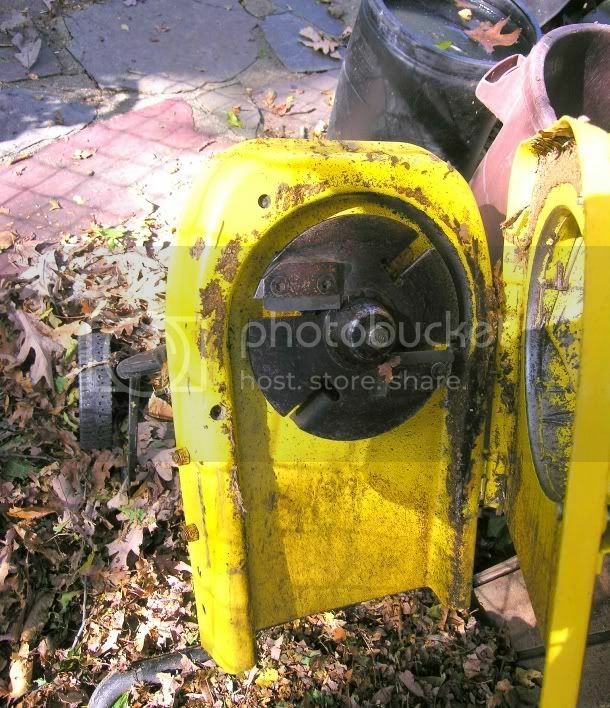 I bought a common garden shredder ($175.00) which can shred leaves and small branches. 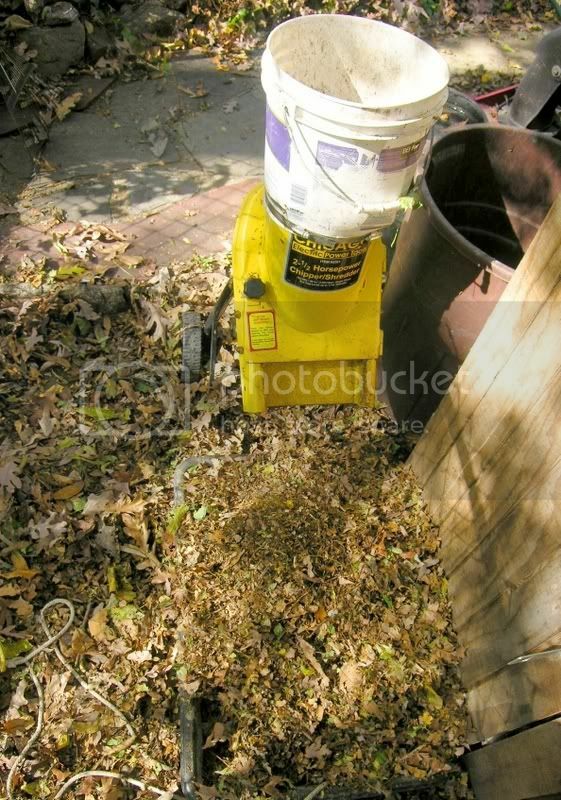 It does a good job of shredding leaf and branches, but not much more. I was able to find some tungsten carbide blades which were from an electric wood planer, which I machined to replace the carbon steel blades that came with the shredder. As you may know, tungsten carbide is extremely tough and the blades can hold a keen edge for a long time. Now I not only can shred leaves and branches, I can actually pulverize large bones, clamshells and any hard stuff. We eat a lot of sparerib, ox tail and corn-on-the-cob, the leftovers all go in the soil towards making better tomatoes and veggies. Tungsten carbide blades? What the bloody 'ell's tungsten carbide blades? You could've posted this in MY thread ???!! 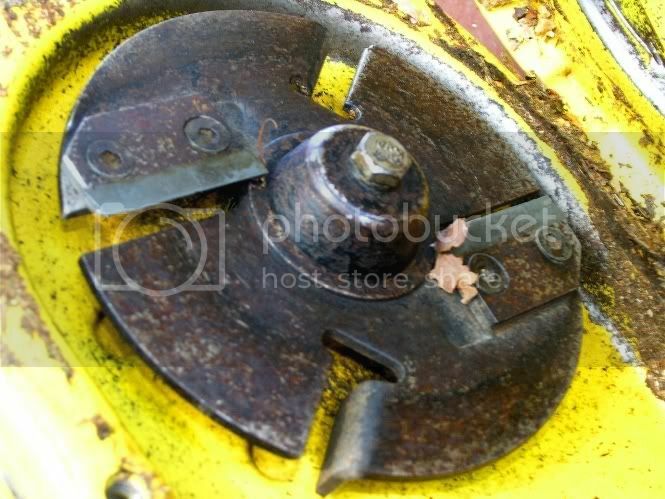 I, too have a chipper shredder for preparing compost. My blades are the soft steel style, but it does the job. The only thing, I have always understood that you need to stay away from putting animal parts into compost. I'm not completely sure why except it may have disease causing properties or attract varmints or something. Maybe if the compost cooks hot enough you don't need to worry. Compost does help good tomatoes grow gooder. DC, man, you are dangerous with that repurposing stuff to fit your needs. I would bet the manufacturer would choke with mods. you made. Still, I wouldn't mind doing that myself. As for putting animals bits and pieces in, it is exactly that the pathogens in critter decay can be a problem if not properly done. I have heard of, I believe it is Minnesota, using road kill in their soil amendment program. But, they have special bins and monitors to make sure the heat is correctly done. 1. As with any machine tools, always wear eye protection. 2. The shredder comes with double safety cut-off switch. It would not work if the blades are exposed. Still I am superstitious. I unplug the shredder before I have to open and clean it. 3. I do not use raw bones and meat. I only use cooked bones. There are rats, dogs, cats, possums, racoons in the area, I never have any problem in the few years I have been doing this. Maybe the bones are so finely chopped and tilled into the soil. I have not had a soil test done, but I think I do not need to add phosphorous. Did you remove the flapper on the top and replace it with the bucket ? I have the same type of shredder and it's a real slow process feeding handfulls thru the thing. I'd prefer to modify mine to be able to shovel them in. I am starting to work my soil (Z6/7) to get ready for the transplanting. I have collected a whole winter's worth of bones and shells; Spare ribs, ox tail bones, crab/lobster shells, oyster/clam shells, chicken bones ------------------. Using the modified shredder, I was able to pulverize everything and tilled eveything deep into the soil. Last edited by dcarch; March 27, 2007 at 11:20 AM. Your comments remind me of that crazy movie..Fargo and the scene with the chipper. Oh yes. There are other uses! Oh man! Now THAT is funny! I just watched that one the other day, too! ...You're all bloody fancy talk since you left London. I just heard today, in the composting specialist class I'm taking, that kelp/seaweed is actually better off being buried in your beds than composted. It does more good that way. This is what the fellow, who taught part of the class, said after someone asked about composting seaweed.